All of your favorite features from GU103: The Menagerie are getting bigger and better than ever! 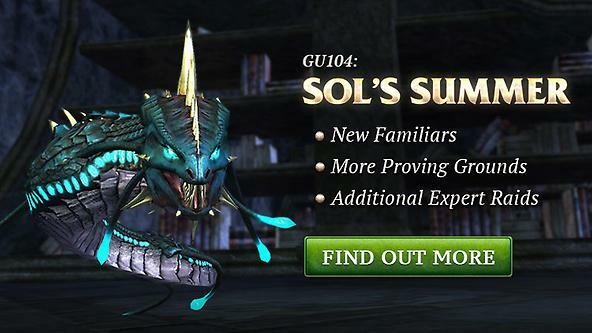 GU104: Sol’s Summer brings new additions to Familiars, Proving Grounds, and Expert Raids as well as a host of balance changes and more! Code has been put in place to prevent players from entering any version of the zone while still locked to a previous zone and/or not passed the minimum lockout time. Players will be banished from the zone if they fail this check regardless of any lockouts displayed on their lockout window. This applies to Vaedenmoor: Heart of Nightmares [Raid] and Vaedenmoor: Realm of Despair [Raid]. Any previously saved zone instances have been reset. Noxious Attuned can no longer be resisted. Trakanon should now call out his target when he snaps his jaws. The Meld of Haze is now immune to the ROOT effect from Terrestrial Coffin. Jawharah Izzah, Shady Erudite at the Nektulos Docks, is now willing to sell Spiritbreaker to those channelers who have completed their epic quests. Jawharah Izzah, Shady Erudite at the Nektulos Docks, is now willing to sell The Wards of Kelkarn to those troubadors who have completed their epic quests. The Pit Champion will now correctly spawn at the end of the arena event. Woven Vulcanized armor pieces from Lord Nagalik now possess additional defensive stats. Stats on the Ring of Removal from King Drayek have been increased to match his other drops. The Prismatic Greatsword of the Scale now has additional weapon skill bonuses. The Truespirits’ Lament – The shadowy creatures that start this quest have been disciplined. They will no longer attack or be visible until Destiny of Velious is available on TLE. Reduced the amount of combat mitigation Darathar gains on Time-Locked servers. Corrected a bug that allowed Darathar to be killed without locking players to the zone. Reduced the amount of combat mitigation The Element of Vox gains on Time-Locked servers. Reduced the amount of combat mitigation The Spirits of Vox gains on Time-Locked servers. Reduced the amount of combat mitigation The Fragments of Vox gains on Time-Locked servers. Reduced the amount of combat mitigation Venekor gains on Time-Locked servers. Added “Camera Shake” option under Display (advanced)  “Camera” to enable / disable camera shakes. All EverQuest II Servers will be brought offline on Tuesday, August 1st, 2017 at 7:00 AM PT (14:00 UTC) for an update. Estimated downtime is less than 2 hours. UPDATE: Today’s downtime has been delayed til 9:00am PDT (Noon EDT). Servers are now down for maintenance. Terris-Thule will no longer speed up her casting of her AE spells with the removal of the “Daydream” spell. Corrected an issue that would occasionally cause Saryrn and Terris-Thule to become immune to all damage. Shanaira the Prestigious should now give slightly more time to react to the combo elements of her encounter. Terris-Thule will no longer stoneskin while rampaging. Corrected an issue that would cause the Gatekeepers to think pets were not allowed to damage them if their owner challenged them. Terris-Thule no longer casts the “Daydreamer” spell. The spells “Touched by Nightmares” and “Touched by Torment” now persist through death. The adds in the Saryrn encounter should now despawn if Saryrn leaves the encounter or is slain. Some health adjustments to Saryrn and Terris-Thule. The buff spells that are assigned to groups should now put “Outsider’s Recognition” on the group the boss has targeted instead of a random group. All EverQuest II Servers will be brought offline on Thursday, July 18th, 2017 at 7:00 AM PT (14:00 UTC) for an update. Estimated downtime is less than 2 hours. Increased the maximum Ethereal reward chances from 3 to 4. Added a forced description to the Ethereal cloak merchant lists to correct an issue where it did not always display the purchase requirements on the upgraded cloaks. Two new [Heroic] daily missions that each reward a Sathirian Ethereal crate are now available from Okzil <Daily Mission> in Obulus Frontier within Crusaders’ Cave at 526.8, 252.5, 1295.1. Both missions can be completed each day, but only one can be active at a time. Both missions can only be updated and completed within a Kunark Ascending dungeon labeled [Heroic]. Neither mission will be granted if you already received 4 Sathirian Ethereal reward crates for the day. Because of this restriction, neither mission can be shared. Fracture, the Inheritance Merchant has returned to Freeport and Qeynos. Terris-Thule’s “Drain Life” ability should no longer hit the entire raid. It should work the same way as it does in Vaedenmoor: Realm of Despair[Raid]. The allowable deaths in the Summoned Foes encounter has been increased. The platforms in the Summoned Foes encounter no longer randomize colors beyond the first time. It should be much harder for mercenaries to hold aggro against The Omen Feeder. The reward for completing a checkpoint in a heroic proving ground has been increased from 1 to 2 Marks of Glory. The reward for completing a the final checkpoint in a heroic proving ground has been increased from 5 to 10 Marks of Glory. Territus should no longer cause the spell “Mark of Nobility” to damage ally pets. Baliath should now take longer to start regenerating after he leaves the playable area and returns. Corrected an issue where if you had the Golden Recognition spell on, you could not execute that part of the script the spell implies. Trakanon no longer forces a tank swap. Swapping tanks is now fully up to the fighters engaged in the encounter. Detonators should now auto-engage the raid instead of waiting till they are damaged. Added messaging to Shanaira the Prestigious’ spell combo phase for feedback purposes. Correctly countering her powerful magic should now point out which spells were used as well as who completed the combo. Completed the first pass on an overall damage output adjustment for all classes. These changes have a separate modifier on live, time-locked, and Proving Grounds servers, so that they can be separately adjusted. Channeler heals heal for a percentage of the targets max health on the Fallen Gate server. Percentage heals are increased by the spells level and tier, but do not benefit from caster stats. The Shining Metallic Robe should now be correctly referred to as “Shining” in all instances. Will of the Stormhammers – Brelaine will now break the dwemer for those who may have died or lost connection between approaching the Stone of Kaladim and watching her work her magic. A Mind of My Own – Yapsnarl kobolds are drawn to the bowl of Terratrodder chuck much sooner now. Secrets of Runnyeye – Players that do not yet know Goblish are now able to spawn and fight the Book of Baylzuthak. Secrets of Runnyeye – Players that do not yet know Goblish are not able to read the Book of Baylzuthak, but are given direction to learn the language. A Clockwork Snoop – Gnome Observatrons are removed from the player’s inventory when the quest is deleted. A Stealthy Guarding – Quest now updates consistently for the group when the mob of Blackscale terror attackers are defeated. Return of the Light – The Lucanic Knight Initiate can no longer be damaged until a certain event transpires. Kaesora: Xalgozian Stronghold [Heroic and Solo]: Spirit Shepherd – The lost spirits will more reliably follow you. Claiming the Goblish Tongue – Goblins in Runnyeye: The Gathering, Nu’roga, and Twark now have a chance to drop a Goblin Territory Marker. Lian Augren’s mail entitled “A Gathering Obsession” will now only be sent once the Isle of Mara is available. Heritage items have been rebalanced across the board. In addition to new stats, several heritage quests that offered rewards only to specific classes now offer a selection of rewards. Damaged items in an equipment set will now have the damaged back-glow appearance instead of the equipment set back-glow. Two-handed weapons should now have double the stat bonuses of one handed weapons of the same level and quality. Velious: Several collection rewards have been updated so that their stats are in line with progression. Corrected an issue with Sarya Val’Sara that prevented her from selling the Drake of the Grove and Burnie. Corrected an issue with Celestial Gate that could prevent it from activating after dying until the caster zones or un-equipped and re-equipped the rune. Platinum amounts over 1 million should be displayed better. Fixed an issue with proving grounds where loyalty points could be reset. Corrected an issue with damage variance on several Skyshrine Guardian and Skyshrine Infiltrator abilities that allowed them to hit for higher then intended amounts. Item rewards from Shade of the First Brood, Battlement Bound, Ill Omen, and Long Live the Emperor are now only acquired by looting a chest that spawns near the public quest. You will have 5 minutes to loot your rewards from these chests after the public quest ends. 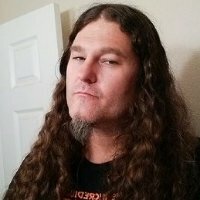 Defiler Crystallized Soul, Necromancer Dark Heart, Conjurer Shard of Essence and all priest summoned resurrection baubles should now function in Proving Grounds. Corrected a situation where the ritual barrier did not block the “Basilisk Bite” spell. Vhaksiz the Shade should no longer wipe out the raid if the “panic” script is triggered. Corrected an issue with Baliath’s enrage timer causing the duration to become additive over the course of the encounter. You can now hide your ‘Not For Sale’ items when at a merchant. You can now filter the broker by Ascension Classes. Most cleric reactive heals have been increased in the Proving Grounds by 30-40%. Poxy can now be damaged. The Reet Ritualist should now despawn when encounter resets. The entrance door should no longer require 18+ players to enter. The exit door should now allow use. Basilisk Bite should no longer overwrite itself when attempting to apply it twice. All EverQuest II Servers will be brought offline on Tuesday, May 9th, 2017 at 7:00 AM PT (14:00 UTC) for an update. Estimated downtime is less than 3 hours. Interested adventurers should search within Obulus Frontier for clues on how to begin this new quest. Good hunting! Experts in the mysterious menagerie have discovered a subspecies of creatures that have been found to increase the master’s ability to channel greater power. You can access the Familiar window via a tab in your character UI. This update includes two new cooperative competition zones (Battle upon the High Seas and Battle for Felwithe) that allow groups of up to six to compete against each other in timed races to see who can complete the zones’ challenges first. Only one zone is available at a time, and the fastest times for each round, currently set for seven days, will be recorded on a leader board accessible from within the Proving Grounds. To keep things competitive, stats granted from gear are not added to the character in the Proving Grounds. All heals and wards are percentage based while in the Proving Grounds, scaling off of spell tier and level. Just stopping by to give everyone some information on what we have coming this year and some insight on the direction we are going. The team has been busier than a pack of Brownies in a bag of catnip! There’s plenty coming up this year, so let’s get right to it, shall we?! First, on Tuesday, May 2nd we are launching the first of our Level 100 Co-opetition Challenges in the Proving Grounds! What the heck is “co-opetition”? Well…Cooperative Competition, of course! In teams, you can compete side-by-side with other groups – and even sabotage their progress – as you mow through baddies so you can win! Why win? For new loot and bragging rights! We will start with one Co-opetition Challenge and switch it out with a new match type or layout periodically. Woot! The number of adds in the Raenha, Sister of Remorse encounter should no longer grow for each successful threshold passed. The number of adds in the Raenha, Sister of Remorse encounter required to be killed if the script is failed should no longer grow. Deaths in the Raenha, Sister of Remorse encounter still affect add numbers. Respawn speed on adds in the Raenha, Sister of Remorse encounter are no longer affected by reuse debuffs (in players’ favor). All adds in the Raenha encounter now count toward the add count mechanic. Xalgoz should now send a warning message for his event at 5%. Adds in most tier 4 encounters have had their combat mitigation reduced. Adds in the Warden of Nightmare encounters have had their respawn timers corrected to intended values. Corrected an issue that occasionally caused 4 adds per round instead of the intended 3 in the Warden of Nightmares encounter. Sabellah’Xen, Keeper of Fire’s adds now despawn when he is defeated or when his encounter is reset. Caelan’Gael, Keeper of Growth’s adds now despawn when he is defeated or when his encounter is reset. Lachina, Defender of Magics’ adds now despawn when she is defeated or when his encounter is reset. General Janosz’s adds now despawn when he is defeated or when his encounter is reset. High end difficulty encounters have had their “Panic” mechanic made a bit more lenient toward the beginning of the encounter. Vhaksiz the Shade has had his health adjusted. Xalgoz has had his health adjusted. Xalgoz’s Staff of Control should now correctly be able to be used on Xagloz but is still not a required item to defeat his encounter. The Strathbone Runelord should no longer remain immune to damage at low health for an extended amount of time. The downtime ran an additional hour and there was a tweet advising us about it. A bunch of Update Notes, but the one you’ll probably be hearing the most about appears, at first glance, to rein in the incredible power of items such as Ethereal Onslaught, Ethereal Conduit, Ire-Dread (the hammer), Spine of Ancient Terror, Spine of the Deep One, which can Reset the Reuse of some or all of a character’s abilities sometimes several times a minute. This effect has been the subject of much debate on the forums for the last year and a half. Added Resolve as a searchable stat on the broker. Fixed a bug where switching your warder in the warder UI would not update the abilities displayed. Fixed an issue where tool-tip information would not display correctly on some Deity abilities above rank 12. Adds for Captain Vhankmin and Tabor’Zaai should now despawn when the encounter is defeated.